This article from The Palletizer, a U.S. 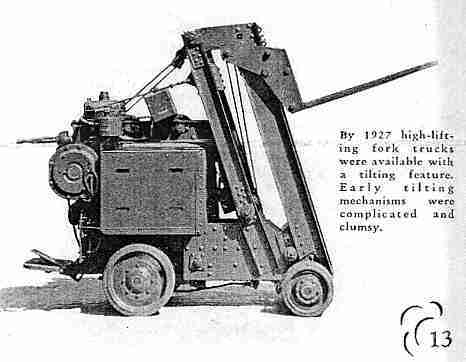 Naval magazine for suppliers during the Second World War, reviews the history of the fork truck, up to the mid-1940s. The Palletizer was a key communication medium of the Navy to share materials handling best practices with its suppliers. 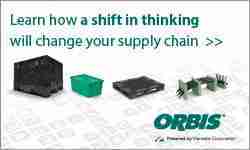 Handling advantages once distributed among many different types of equipment are now combined in the modern fork truck, but it has taken years of development and research. The first contribution towards scientific materials handling equipment (over a hundred years ago) appears to have been the two-wheel hand truck, which is useful as ever on many types of jobs. The early models were built by local manufacturers with unmachined, wrought iron axles and cast iron wheels. They enable loads to be picked up and transported without being lifted manually and probably represented the earliest application of the cantilever principle to materials handling equipment. Back in the last century, every railway station of any size had its hand-operated four-wheel baggage wagon. While these conveyances had to be loaded by hand, they could carry a much heavier load than the two-wheel truck. 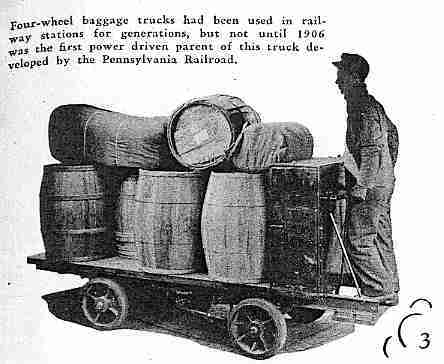 In 1906, an official of the Pennsylvania Railroad at Altoona, Pa., added storage battery power to a baggage wagon, producing what was probably the first powered platform truck. The controls were placed so that the operator had to walk out in front. So popular was the idea of powered trucks that their use rapidly extended to other lines of industry, but there was no thought of mounting elevating equipment until much later when the success for the portable elevator created the demand. The first portable elevator on record in the patent office was built of wood in 1867, with uprights, a cantilever platform, and a hoist. The inventor was apparently not particularly skilful in sales promotion, since his excellent ideas were not utilized for nearly forty years. A few elevators were built by other designers, but they proved impractical, and the equipment did not come into general use until years later when one was designed on the original principles, and made of steel and gray iron castings. By 1904, revolving bases had been developed to permit easier loading and tiering. Though portable elevators have undergone no basic changes of design since that time, except for the addition of power, they are still excellent equipment – particularly on small jobs where more expensive machinery is not economical. One of the early efforts to combine horizontal and vertical motion was in 1887, when a crude truck capable of lifting its platform a few inches was built. This was probably the first application of the unit load principle with skids, and it is hard to believe that nothing more came of the idea for over twenty years. 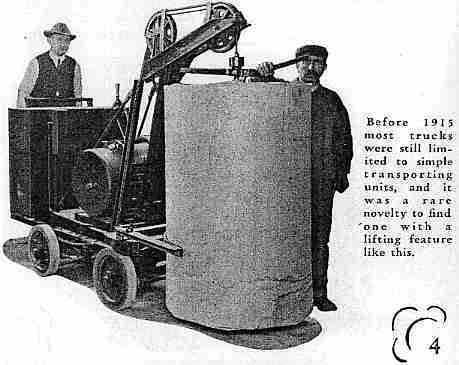 It was not until 1909, when the first all steel lift truck appeared, that unit load handling really took hold, getting its start in paper factories. 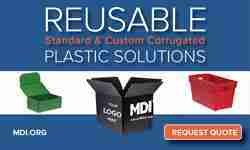 At that time dozens of concerns went into business manufacturing the equipment, and took out all kinds of patents. One of the most successful of these pioneers conceived the idea of using ball bearings in the wheels of his trucks. It is significant that his salesmen sold not so much on the apparently obvious advantages of handling by unit load which the new trucks made possible, but simply on the fact that the ball bearing wheels permitted a man to pull 4000 pounds instead of 1500 pounds. Five years later, the same concern which introduced ball bearing trucks obtained patents on the hydraulic lift principle. These patent rights, together with the difficulty and expense of getting close enough tolerances, resulted in a virtual stoppage of experimental work on hydraulic trucks until 1932. In 1913 a truck appeared which added electric power to the advantages of combined vertical and horizontal handling ability. It took the form of a small crane mounted on a platform truck. Under the impetus of increased production requirements occasioned by the war, this was soon followed by the development of powered platform-lift trucks. On the earlier models, the lifting had to be done by hand, but 1915 saw the introduction of a truck powered both horizontally and vertically. A survey in that year indicated over 1000 powered trucks in use in the United States and Canada. The first skids used b these machines were live or semi-live, being merely modified hand trucks. Sometimes flat wooden platforms were used with four separate legs which had to be placed into position under the platform every time it was set down. Later two of the legs were joined, making only three pieces to handle instead of five. When skids, as we know them today, did come into use, they were made in many different sizes, heights, and designs, with the result that a skid which fitted one truck might not fit another because the lifting ranges of the trucks were so small. However, this difficulty did have one good result. About 1919 some high lift trucks were built which raised their platforms several feet to provide a greater range of operation and permit handling the many different types of skids. From here it was only a short step to tiering. Postwar standardization the same year eliminated the rest of the trouble and has resulted in keeping the platform truck skid system useful right up to the present day. The year 1919 also saw the development of vertical lifting cantilever trucks as well as the introduction of forks and rams. The cantilever feature enabled these trucks to drive right up to a stow without requiring clearance underneath for projecting front wheels, while the forks and rams provided a means of handling many different types of objects. Some of the first trucks with forks were merely platform trucks to which bars had been welded. Fork trucks were not really used extensively until after 1926, though many improvements were made on them and many experimental models built between 1919 and that time. The most notable achievement during this period was a continued shortening of the wheelbase without sacrificing stability. The introduction of the center-controlled truck was helpful in this because it placed the heaviest counterweight, the battery, at the maximum distance from the fulcrum. Other developments included devices to permit the entire mast to tilt either forwards or backwards independently of the lifting mechanism, and the introduction of welding in place of riveting for stronger, lighter construction. Shallow skids or one face pallets were first used in 1923, but the idea remained in experimental states for several years. Even by 1927, very few concerns were using them. 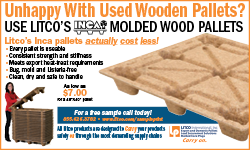 The difficulty with the one-faced wooden pallet was that it was much weaker and less durable than the ironbound skids which were in general use. Pallets had to wait until 1930 when the research of a large can manufacturer revealed the great strength inherent in the two-faced design, which could still be built for less money than standard skids. From the early ’30s to the present, the history of the fork truck has been one not so much of developing new principles as of discovering wider and wider applications for those existing. The extensive uses to which the armed services have put this equipment during the war is outstanding evidence of its industrial importance. Nevertheless, the designing of materials handling machinery may still be considered a young science with great things in store for it. Return to the History of Pallets home page. 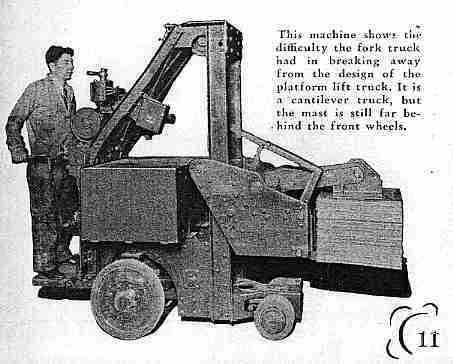 The picture of the very first forklift on the page featured an Elwell-Parker motor! http://www.elwellparker.com/our-legacy It was developed by Pennsylvania Railroad in conjunction with Elwell-Parker to solve their luggage transportation problems.